Looking for a fun way to teach letter formation and sounds? Then these interactive printable puzzle Alphabet Read & Trace pages are a perfect find! 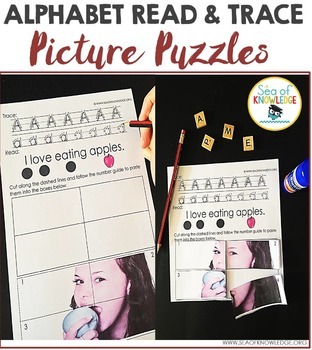 They include a guide to practice each letter formation in uppercase and lowercase written form, then a guided reading sentence as well as a picture puzzle. Best of all they are on ONE PAGE! The download can be found at the END of this blog post. They are so easy to prepare! Just print them out and get the kids to trace then cut out the picture puzzle and ‘put it back together’. There is a number guide on the picture to help them identify what goes first. The pictures include real life images corresponding to the alphabet so this helps the kids especially ESL kids really connect with their alphabet and relate it to the world around them. The sentence can be read as a whole class or during groups and the kids will use the guided dots to help them follow the words. You can find the full pack right HERE on Teachers Pay Teachers. Ready to get the kids practicing their alphabet?